Las Vegas-based American Patriot Solar, aka AP Solar, has a new solar-energy champion, and it is someone who made his living investigating facts. 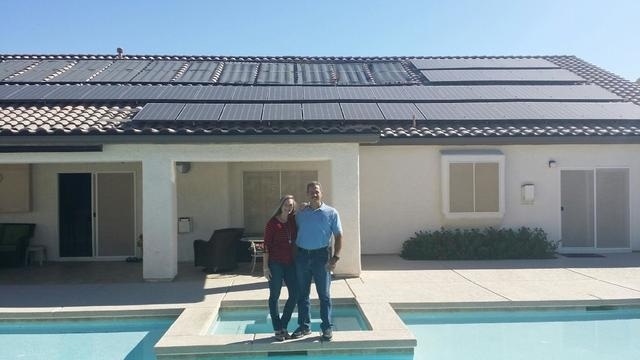 Stan Hyt and his wife, Danette, recently installed a 42-panel AP Solar system, light-emitting-diode lighting and two programmable thermostats at their Las Vegas home. Courtesy photo Pictured are Danette and Stan Hyt at their Las Vegas home with a new AP Solar system, LED lighting and programmable thermostats. The couple, which has lived in Las Vegas for more than 20 years, researched several options before choosing its system. Hyt said she found getting more than one estimate helped in comparing solar companies’ knowledge and service capabilities. Hyt said the couple’s 3,500-square-foot home was generating up to $400 per month in electric bills, so the solar energy system couldn’t have come at a better time. One benefit of working with AP Solar was how easy they made the process, said Hyt. “Not only was it a better value, but they made it very easy for us,” said Hyt. “We have already benefited with lower energy bills, and with a $500 check we received for referring a friend to AP Solar,” said Hyt of the company’s referral program. American Patriot Solar also helps its customers apply for federal tax credits currently available for U.S. homeowners that install solar systems. With the AP Solar system is up and running at their home, the Hyts can monitor their energy use via an app on their smartphones. “I really like how we can look at our phones and see how many kilowatts our system is generating each day,” Hyt said. American Patriot Solar, a Southern Nevada-based solar energy company, is committed to providing Americans with energy independence … one rooftop at a time. American Patriot Solar systems are installed by its installation company, U.S. Renewable Energy Development (license #0075882), also a Las Vegas-based company. To schedule a free in-home consultation and analysis of your solar energy opportunities, call American Patriot Solar at 702-227-9205 or visit www.apsolar.com. All customers who schedule an in-home solar energy consultation will be entered in a monthly drawing for a five day-four night cruise for two to Mexico, the Bahamas or the Western Caribbean, along with local dining certificates.